LAPAN-A2 is a microsatellite developed at the Indonesian National Institute of Aeronautics and Space, making it the first indigenously designed satellite of Indonesia. The satellite is based on the 2007 LAPAN-TUBSAT microsatellite project – a partnership between Indonesia and the Technical University of Berlin that was used to train LAPAN engineering staff in the development, manufacture and conduct of a microsatellite space mission. 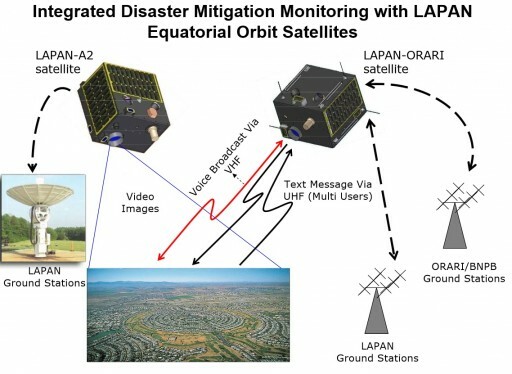 The objectives of the LAPAN-A2 mission are threefold – the satellite aims to deliver high-resolution video for Earth Observation Purposes, support the Automatic Packet Reporting System as a voice repeater in disaster mitigation, and collect Automatic Identification System data for maritime monitoring. Furthermore, the satellite also acts as a technical demonstrator testing a series of new space systems for future Indonesian satellite developments. The development of LAPAN-A2 also included the establishment of much of the ground infrastructure for satellite construction and testing which had not previously been present in Indonesia. LAPAN-A2 has a mass of 68 Kilograms and is 47 by 50 and 36 centimeters in size. An internal divider creates two shelves within the satellite to facilitate the various bus and payload components. The upper compartment is larger than the lower and facilitates bigger components such as the imaging payload and satellite batteries while the smaller components such as the electronics reside within the lower shelf. The satellite employs body mounted triple-junction Gallium-Arsenide Solar Cells attached to the four side panels of the satellite. Each solar panel is 47 by 26 centimeters in size and holds 30 cells for a maximum power generation of 32 Watts. Power is stored in three Li-Ion batteries that are arranged in parallel, each with four cells per pack connected in series. The total storage capability is 17 Amp-hours and the power conditioning and distribution system delivers a stable bus voltage of 17 Volts. The LAPAN-A2 Attitude Determination and Control System builds on that of the first generation satellite, but expands the base system by adding GPS receivers and a more complex attitude control system to increase the pointing accuracy of the satellite. Three pairs of reaction wheels are the primary source of attitude actuation with three magnetic torquers used for momentum dumps from the wheels as well as drift correction. 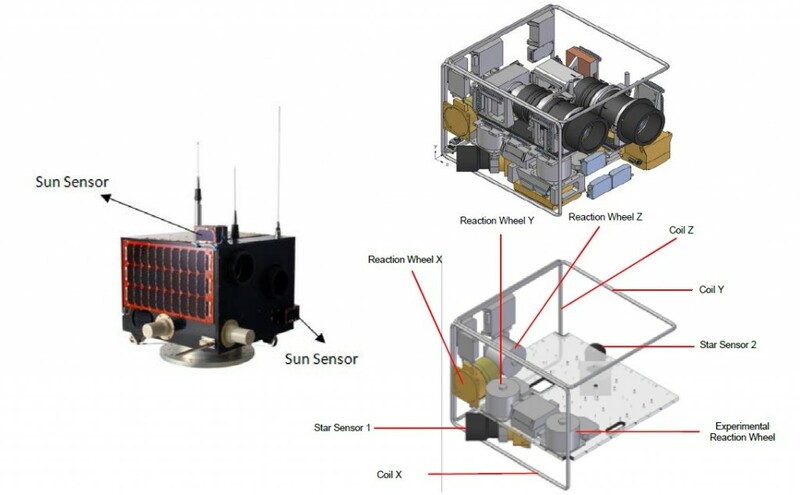 Coarse attitude determination is delivered by six sun sensors and a series of gyros can be used to precisely measure the three-axis rates on the satellite. When precision control is needed, LAPAN-A2 uses data delivered by two Star Trackers. To avoid any systemic design issues from completely disabling the satellite’s precise attitude determination capability, two different star trackers are installed on the spacecraft – one with a CMOS detector, the other using a CCD detector. 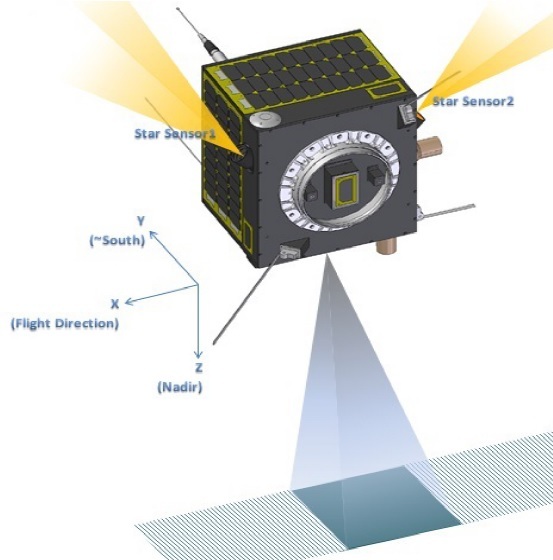 The working principle of the two star trackers is identical – capturing images of the sky for comparison with known star patterns in an algorithm that delivers precise attitude data to the spacecraft controllers. 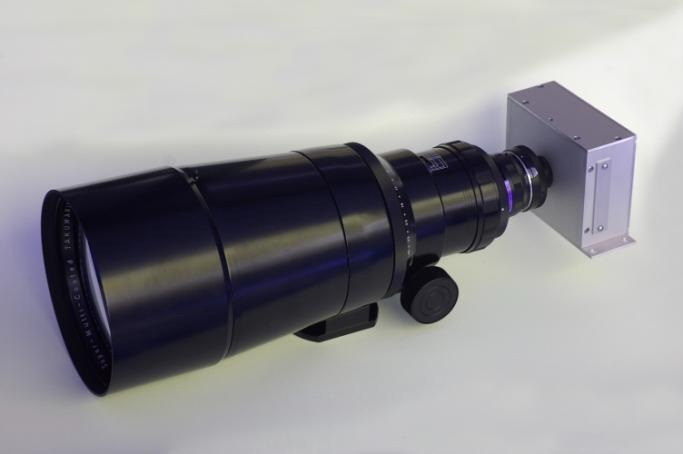 The CMOS-based sensor has a field of view of 14 by 14 degrees and delivers four attitude quartenions per second while the CCD system has a wider field of view of 31 by 23° and outputs five data sets per second. 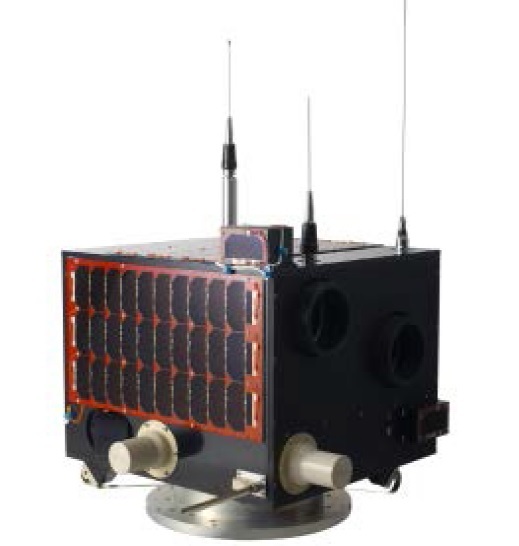 The LAPAN-A2 satellite is capable of operating in a number of attitude modes, such as a constant nadir-pointing orientation to face the imaging system nadir along the ground track. Off-nadir pointing and target pointing is also possible with target pointing used to keep a selected target within the field of view for a period of time while video of it is acquired for stereoscopic imaging. Inertial pointing in which the camera is pointed to a celestial target in space is also available. LAPAN-A2 can use an automatic capturing sequence which will become the operational mission mode after in-orbit testing is complete. The spacecraft controller uses inputs from the star trackers and gyros for precise attitude and rates as well as the GPS receivers for position and timing solutions to generate commands to the attitude control actuators in a closed-loop process to point the satellite to the appropriate direction where the target is located. Target pointing up to +/-30° in the pitch and yaw axes can be supported by the satellite. Communications are accomplished in UHF and S-Band – UHF is used for telemetry downlink and command uplink while payload data is transmitted to Earth using an S-Band system. Orbiting the Earth at an inclination of 8 degrees will allow the LAPAN-A2 satellite to have a ground station pass on every of its orbits with a system of ground stations in place to cover the satellite’s entire pass over the vast west-east spread of Indonesia, maximizing the volume of data that can be downlinked. 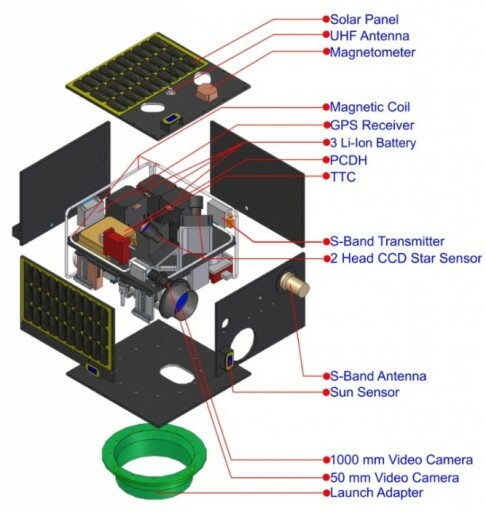 The main payload of LAPAN-A2 is its Video Camera Assembly that consists of two camera systems – one is the heritage camera employed by the first generation satellite featuring an analog data output while the second is a more powerful camera that captures digital video. The digital camera system is a CMOSIS 4000 model provided by Theta System Elektronik, Germany. With a focal length of 60 centimeters, the camera system can deliver frames of 12 by 12 Kilometers at a ground resolution of 6 meters from 650 Kilometers in altitude. The RGB format camera can tolerate large variations in illumination and supports different operational modes. The camera employs a CMOS detector of 2048 by 2048 pixels with a standard 5.5-micrometer pixel size and a 12bit digital data quantization. The second camera is based on a commercial Sony Camera that is outfitted with a color splitter prism to deliver 3 CCD matrices to improve the image location accuracy. Each CCD matrix has a size of 752 by 582 pixels and the camera can image a ground swath of 4 Kilometers at a resolution of around five meters. The dual camera system can be operated in two different modes – the first is an automatic targeting mode based on a closed-loop control involving the satellite controller, attitude determination and control system and the payload itself. The second mode is an interactive sequence that uses the video camera to locate the target before high-resolution image acquisition is initiated. Given the vast stretches of territorial water belonging to Indonesia, the addition of an Automatic Identification System payload to the LAPAN-A2 satellite was a requirement introduced early in the mission planning. LAPAN-A2 carries a single AIS antenna and receiver capable of receiving multiple parallel signals in any of the two channels in the maritime VHF band. The third payload of the satellite is the Automatic Packet Reporting System that serves as an amateur radio and radio voice repeater. Natural disasters such as Earthquakes, Tsunamis, floods and volcanic eruptions are more frequent in Indonesia given its location on the globe. Since these events often damage communications infrastructure on the ground, coordination of search and rescue efforts are made more difficult in the stricken regions. LAPAN-A2 could help in in such a scenario, carrying a text and voice message repeater operating at the VHF/UHF wavelengths.